Special Containment Procedures: When not being used for testing, SCP-1753 is to be kept in a 1 m x 1.5 m x 0.5 m fireproof safe in a standard storage unit at Sector-28. Personnel are to avoid direct line of sight with SCP-1753 to minimize the risk of accidental exposure. 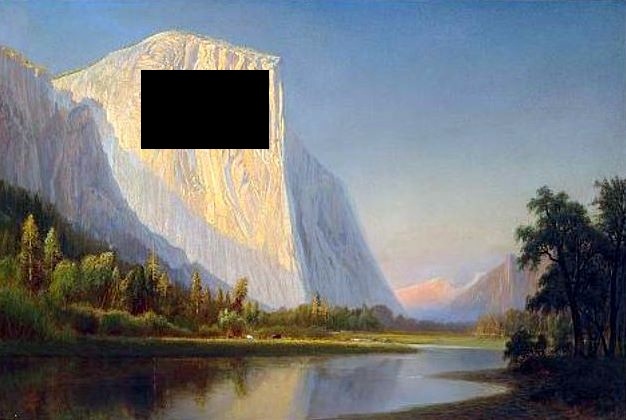 Description: SCP-1753 is a 75 cm x 100 cm oil painting of the El Capitan rock formation in Yosemite National Park. The phrase “time to fly” has been scrawled in permanent marker over the vertical rock face. Forensic analysis of SCP-1753 revealed that this phrase was incorporated by the painter. When a human capable of sight observes the painting and comprehends the written phrase they will activate SCP-1753’s anomalous effects. Subjects initially experience a strong sense of vertigo that subsides within approximately thirty seconds. No further effects will be experienced for a period of twelve to fourteen hours. After this time period the subject begins to perceive any “drop” (e.g. a curb, a stair, etc) as being a vertical cliff face of approximately 2,000 m in height. While this will initially only occur on a small percentage of drops encountered the effect progresses until any vertical displacement higher than 5 cm results in a sheer cliff face. Amnestics have proven ineffective at removing SCP-1753’s influence. Should an affected individual jump from a perceived cliff they will hover in the air for approximately thirty seconds before impacting the ground with force comparable to that expected of striking the ground at terminal velocity. Subjects equipped with BASE jumping gear are able to make the descent unharmed. Of note is that SCP-1753’s influence appears to be one-way: an affected subject standing at the top of a staircase will see a series of descending cliffs, while an affected subject at the bottom will see only a staircase. SCP-1753 was recovered in 19██ after a woman in ████████, CA reported several minutes of laughter followed by the remains of Herbert ███████ (presumably the creator of SCP-1753) breaking through the ceiling. Foundation agents discovered SCP-1753 in an upstairs apartment with what appeared to be a suicide note (see Addendum 1753-001) painted on the wall of the bedroom.